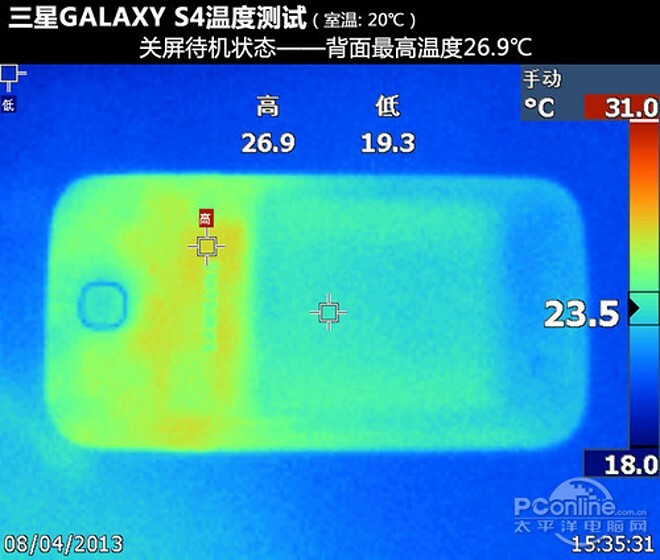 The thermal images of the latest Samsung flagship, the Galaxy S4, have appeared online, confirming that the smartphone will rarely be a problem to handle. The Samsung Galaxy S4 was tested under different stress scenarios, which included gaming, continuous camera usage, 3G internet browsing and HD video playback. Surprisingly, the smartphone kept relatively cool on most occasions, with the lower part (where you’d normally hold it) barely exceeding 20 degrees Celsius. Things got hotter at the top, but the peak temperature stood at 42.6 degrees Celsius (108.7 degrees Fahrenheit) and that was only achieved on one occasion. So while the Samsung Galaxy S4 can feel a bit unpleasant to your left hand if you hold it in landscape and really push it to its limit, the smartphone will cause absolutely no issues in every other scenario.